B+B SmartWorx’s ADAM-6000 Series of Ethernet I/O Modules feature the latest technology enabling them to monitor and control field devices for greater automation flexibility. They are empowered by Peer-to-Peer (P2P) which makes mapping between modules a breeze. In addition, the intuitive Graphic Condition Logic (GCL) allows users to control a single module or between multiple modules eliminating the need for additional controllers or programming. Popular communication protocols are supported including Modbus TCP, ASCII UDP. Furthermore, the Daisy-Chain connectivity of the ADAM-6200 family reduces the need for network switches while retaining reliability of network connectivity with the Auto-Bypass function. B+B SmartWorx’s Ethernet I/O Modules, ADAM-6000 series, accomplishes this integration easily through the latest internet technology, so that it can remotely monitor the device status more flexibly. ADAM-6000 modules are empowered by Peer-to-Peer (P2P) and Graphic Condition Logic (GCL), and can perform as standalone products for measurement, control and automation with P2P and GCL technology. With the easy-to-use and intuitive graphic utility, system configurations can be done in an extremely short time. ADAM-6000 series models include Analog Input/Output Modules and Digital Input/Output Modules. 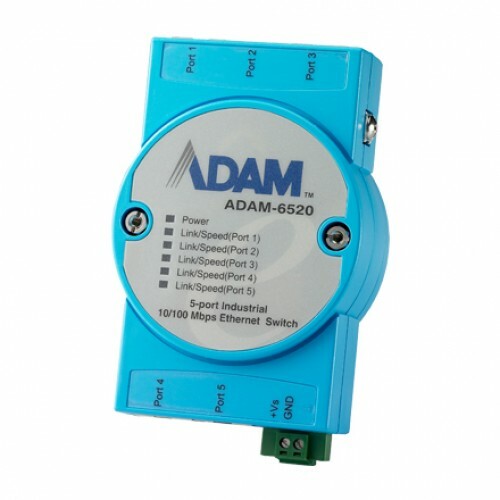 B+B SmartWorx’s ADAM-6100 series is a new line of Industrial Ethernet IO modules. Equipped with the EtherNet/IP protocol, the ADAM-6100EI series also allows daisy chain connections, making it possible to transfer data much faster during process control and other industrial automation applications. Daisy chains also provide a more scalable system and helping improve scalability and improving resistance against interference common in factory settings. Their isolated design prevents our Ethernet IO modules, ADAM-6100 series from breaking down and helps resist harmful field interference. B+B SmartWorx’s ADAM-6100 series is a new line of Industrial PROFINET I/O modules. Equipped with the PROFINET protocol, the ADAM-6100PN series also allows daisy chain connections, making it possible to transfer data much faster during process control and other industrial automation applications. Daisy chains also provide a more scalable system and helping improve scalability and improving resistance against interference common in factory settings. Their isolated design prevents the ADAM-6100 series from breaking down and helps resist harmful field interference.